Luis Ramon “Yori Boy” Campas (who is 47) is still fighting and stopped Joel Jurarez (32-28) on March 16, 2018. His remarkable record is 107-17-3 and he has gone undefeated in his last nine bouts. Over the years he has fought just about every solid fighter out there and, among other accomplishments, stopped come backing and undefeated Tony Ayala Jr. His first fight was in 1987 and he won by KO; he would win his next 12 the same way and was an astounding 56-0 when he met and lost to Tito Trinidad (23-0 at the time) in an action-filled fight for the IBF World Welterweight Title in 1994. Some of the names that dot Yuri Boy’s resume include Cassius Clay Horne, Roger Turner, Jorge Vaca, Heath Todd, Anthony Jones, Jose Louis Lopez, undefeated Raul Marquez whom he stopped to win the IBF World Super Welterweight Title in Atlantic City in 1997, Anthony Stephens, Larry Barnes, undefeated Fernando Vargas, Oba Carr, Daniel Santos, Oscar De La Hoya—and then in later years—Eric Regan, Matt Vanda (twice), undefeated John Duddy by a controversial decision, Eromosele Albert, Norberto Bravo, Matthew Macklin in a fight that many thought he had won, Saul Roman, Hector Camacho against whom he went 0-1-1, Rogelio Medina, Les Sherrington, and Anthony Bonsante. The heavy-handed Campas from Sonora, Mexico has scored 82 KOs along the way and has been a global road warrior in the process. In March 2012, Campas reached a milestone when he won for the 100th time by way of a second round KO of Mauro Lucero. The win gave Yori Boy his 79th win inside the distance and improved his overall record to 100-16. But now comes Sirimongkhon Iamthuam alias Sirimongkol Singwancha (96-4), a 41-year-old Thai welterweight who waxed winless Muhammad Nsubuga on September 1, 2018. 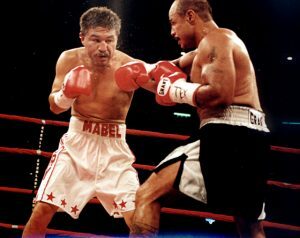 Back in 1995, he beat Juanito Boy Cuma (15—4) for the vacant WBU Super Flyweight Crown and then, in 1996, beat Joes Louis Bueno (8-7-1) for the interim WBC World Bantamweight Title which he successfully defended three times before losing it to Joichiro Tatsuyoshi in Osaka, Japan in 1997. After the defeat in Osaka, the Thai ran off 50 straight wins but against dreadful opposition before losing to Uzbekistani Azizbek Addugofurov in Singapore in 2017. He lost again to Aussie Tommy Brown—also in Singapore—in October 2017. He has fought outside of Thailand on a number of occasions—something that’s rare for Thai boxer. His last decent win came against Dan Nazareno, Jr. (20-11) in 2014. He fought Jesus Chavez (39-2) in 2003 in Austin, Texas and lost the WBC World Super Featherweight title that he won from South Korean Yong Soo Choi (29-3-1) in Japan in January 2003, but that was then and this is now. Between 2009 and 2015, he fought seventeen opponents who were making their pro debut. Others had records like 0-2,0-4, 01, 0-1 (thrice), 2-1, and 10-11. Unless the Thai continues to feast on debuting opponents, Luis Ramon “Yori Boy” Campas quite likely will become the Last Centurion. Jorge Fernando “Locomotora” Castro was the last and he retired in 2007 after a remarkable career in which he won 130, lost 11 and drew 3 times. Roberto Duran, Jose Louis Ramirez, Julio Caesar Chavez, and Harold Brazier were others. But what distinguishes Yori Boy from Singwancha, is that he is a beloved Mexican legend who has done it the hard way; he is earning it the hard way. He may well be the the last of a breed. One other thing, If Yori says he is retiring, don’t bet on it. He has a hunger that doesn’t seem sated just yet. Ted Sares is one of the oldest active full power lifters and Strongman competitors and recently won the Maine State Champions in his class. He is a member of Ring 10, and Ring 4’s Boxing Hall of Fame. He is an Auxiliary Member of the Boxing Writers Association of America (BWAA). Anthony Dirrell (29-1-1) fought Norbert Nemesapati (24-3) in Miami Friday in a super middleweight affair that was part of a PBC card airing live on Spike. Dirrell looked a bit sharper in the first, his punches landing harder and cleaner. Things got more physical in the second, with both men pressing against each other. Still, the round belonged to the effective puncher Dirrell. Nemesapati landed clean a few times towards the end of the second, to be sure, but Dirrell’s beard was too strong. Needless to say, Dirrell ended the round banging away at his opponent. Dirrell’s big punches started taking their toll in the third. Indeed, by the end of the round, the game Nemesapati looked in trouble. To be sure, the man had provided no answers for Dirrell up to that point in the bout. Things began to get brutal in the fourth. Dirrell thudded away while Nemesapati did nothing more than stay on his feet. It was time for the man’s corner to decide whether or not it was time to call it a night. By the fifth, Dirrell was mocking his man, holding his hands behind his back and daring him to swing. Nemesapati, however, was still standing. He was taking an endless beating, but he was standing. By the sixth round, Dirrell actually seemed to be slowing down. Nemesapati may not have been capitalizing on the situation, but Dirrell was no longer able to keep slugging away at will. Fortunately, Nemesapati’s corner stopped the proceedings after the sixth. It was the right decision to make. Their man had simply had enough. The second televised fight of the evening featured Juan Carlos Payano (17-1) and Isao Carranza (15-7-1) in a bantamweight affair. Payano landed some solid shots in the first. Carranza may have had the height advantage, but it didn’t do much for the man in round one (though Carranza did push forward hard in the final seconds). The second round showed good movement on the part of Payano, as well as more effective punching, thanks in part to a very effective southpaw jab. Payano continued to glide along through the middle rounds. In truth, the one sided nature of the fight made the bout monotonous. Indeed, the referee had seen all he needed to by the 7th, and put Carranza out of his misery by wisely stopping the bout. 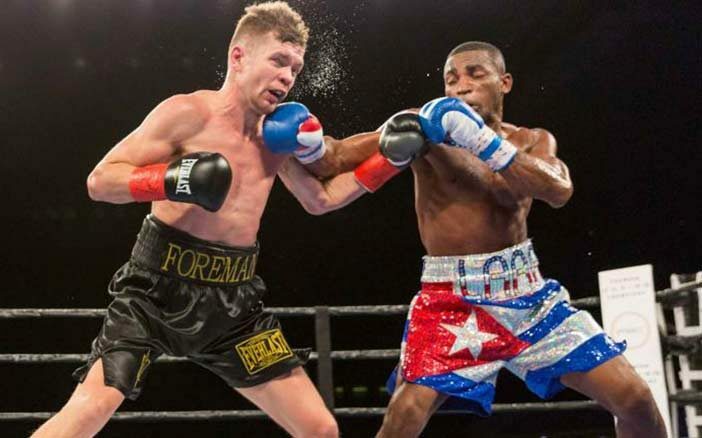 It was now time for the main event between IBO and WBA super welterweight champ Erislandy Lara (23-2-2) and the former WBA world super welterweight champ, Yuri Foreman (34-2). Round one, frankly, was close, though Lara may have edged it. The second round was also a tentative affair. People expecting Lara to blow Foreman out were so far sadly mistaken, though Lara did get a clean shot in during the final seconds of the round. Lara started taking control in the third – though a slip ruled as a knockdown against Foreman was a bit unfair. A thunderous uppercut took Foreman down in the fourth – and that was that. The referee stopped the fight as a wobbly Foreman gamely tried to get up and stabilize himself. It looked like Foreman may have hurt his leg – which had given him trouble in the past – but it was impossible to confirm at the time.